As a participant you have free access to the session page of the session that you where invited to. This page provides all information about the session. What can you find on the session page? Instruction about how to get audio during your session. The session page is based on advanced technology supported by recent versions of Chrome, Firefox and Safari web browsers. Microsoft Edge and Explorer are not compatible. When you are using web-Phone for your audio connection you also need a robust Internet connection with sufficient bandwidth. Dit you receive a Teminar code? Enter it here and visit the session page of your session. For future sessions all information about the session will be displayed on the the session page: what is the subject, who is the speaker and when does it take place. For sessions in the past still the information about the session and the speaker are visible. And if the organizer requested so participants can request for a download link to the audio recording. 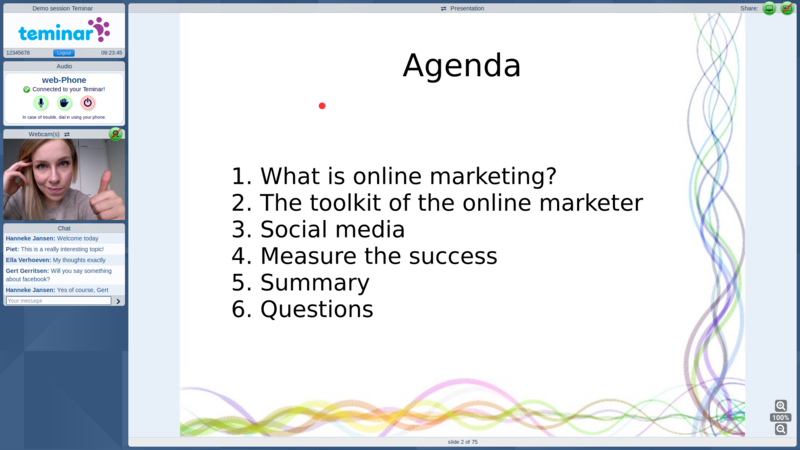 The session page consists of different windows each having specific purpose. Click on one of the windows or read further on this page for more information. In this window you can find the title of the session, the participant access code, the time and a logout button. Here you see how to start audio and what options you have for listening and speaking. This example window shows an active web-Phone connection. This window shows the speakers webcam. If shared of course. If the screen is large enough this window can be exchanged with the presentation window by clicking the title bar of one of these windows. Chat window for all participants and the speaker. This window can show three things: a presentation or desktop if shared or information about the session and the speaker. In case a presentation is shown also zoom buttons and next/previous slide buttons are visible. Please not that for presentations only the pdf-format is accepted. You can listen/speak to Teminar with your phone or with you computer. In the Session page of your Teminar you can see the options for that specific session. Call one or the local access numbers of Teminar and only have the costs of a regular local call. Or have yourself called by Teminar. The telephony costs are charged to the organizer. He or she determines if this is allowed for each session.